Two poets both made their debut in the seventies. One received fame and glory, the other was completely snowed under. Forty years later the two women run in to each other. What follows is a mean spirited settling of old scores, featuring a never-written work, and never-lived life. Mirthe Kamp (Olga Zuiderhoek) was widowed recently. Her husband was the well-known poetry critic Alex Kamp. Although she still writes everyday, Mirthe never published any of her work, after her debut ‘Child of Mist’, in the early seventies. How very different from Sasha van Loon’s (Ria Eimers) career, attracting a lot of attention with her debut Phaedra’s Tears, and becoming the queen-without-a-crown of Dutch poetry. While Mirthe has to deal with her husband’s heritage, moving out of their old house, and painful legs, she meets her old rival. Perhaps it’s not too late, perhaps she can still show the world what she has to bring to the table. 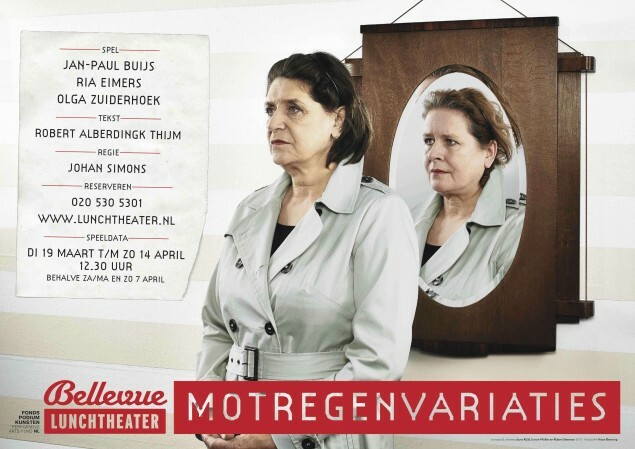 Robert Alberdingk Thijm wrote the play exclusively for Ria Eimers and Olga Zuiderhoek. A play about desiring recognition and the fear of failure. Director Johan Simons (Hollandia, NTGent) is quartermaster of the Münchener Kammerspiele, one of the leading theatre companies in Germany.